Formulated to possess all of the working properties that artists demand, Speedball Professional® Relief Inks are made from the highest quality, lightfast pigments and contain no fillers. They roll out consistently and transfer beautifully, resulting in intense, crisp, archival prints. Containing (10) single-pigment colors and a Transparent Base, these professional-grade inks all carry the AP Seal and can clean up easily with soap and water or traditional window cleaner. Most notably, the Speedball Professional Relief series boasts its flagship color-Speedball® Supergraphic Black, created by world-renowned relief artist, Bill Fick. Want to learn more about this incredible line? Select from the links below to see how Speedball Professional Relief Inks came to be and see them in action in Bill Fick’s Supergraphic studio or visit the Speedball Professional Artist Network page to view finished work of some of today’s most popular relief artists. For what types of printmaking are Speedball Professional Relief Inks best? While Speedball Professional Relief Inks are specially formulated for all types of relief printing, they are ideally-suited for linocut and woodcut. How can I modify the inks’ viscosity and/or transparency? To stiffen Speedball Professional Relief Inks, add talc or magnesium carbonate. To thin, simply add water. To increase transparency, add Speedball Professional Relief Transparent Base. What type of paper should I use to print with Speedball Professional Relief Inks? Any acid-free paper is suitable for use with Speedball Professional Relief Inks. We recommend Arnhem 1618™ Printmaking Paper. Speedball Professional Relief Inks can be printed on dry or damp paper; however, we advise keeping the paper fairly dry to minimize the risk of the water-miscible oil-base breaking down over time due to the water. How should I dry my prints? Speedball Professional Relief Inks dry by oxidation therefore, drying prints in a warm, dry environment is best. While the inks do contain some driers, artists may add up to .5% of traditional driers to the ink to expedite drying time. Do I need to use solvents or spirits for cleanup? No! Designed with a water-miscible, oil base, the Speedball Professional Relief Inks can be easily cleaned up with soap and water or traditional window cleaner. 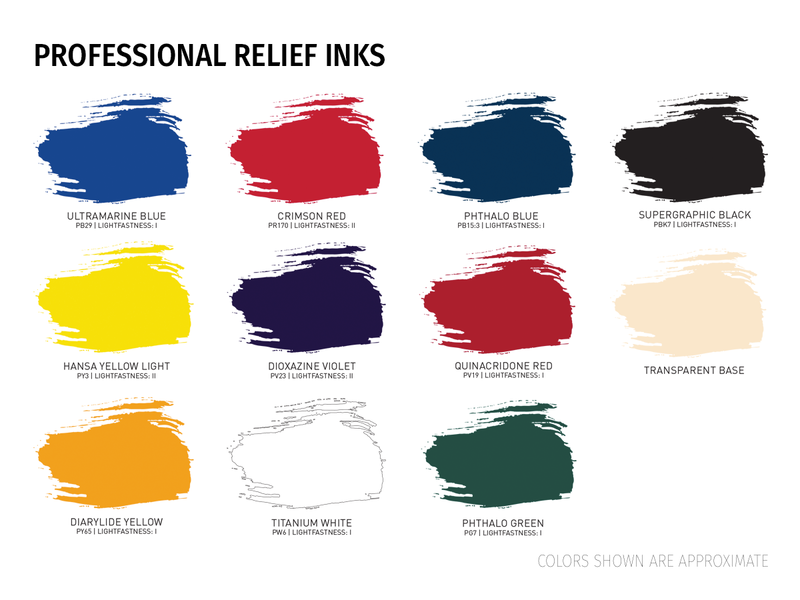 Are Speedball Professional Relief Inks available in sets? Yes! Speedball Professional Relief Inks are available in (2) Sets-- Speedball Professional 4-Color Set: (Supergraphic Black, Quinacridone Red, Hansa Yellow Light, Phthalo Blue) and Speedball Professional 6-Color Set: (Supergraphic Black, Quinacridone Red, Hansa Yellow Light, Phthalo Blue, Titanium White, Transparent Base).